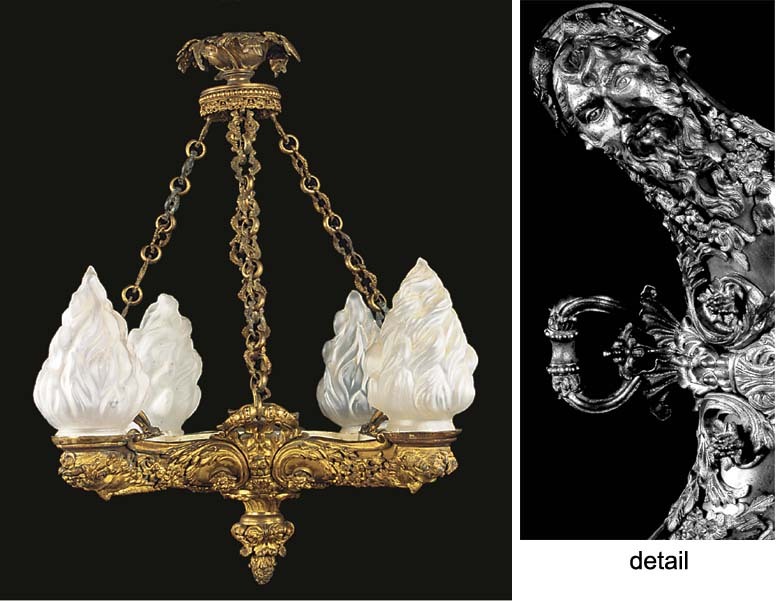 The 'Roman' lamp is richly embellished in bas-relief with satyr masks and Bacchic 'thyrsus' cones in the early 19th century French or 'Louis Quatorze' fashion promoted by the architect J.B. Papworth (d. 1847). A design for a related Bacchic lamp features in his designs preserved at the Victoria & Albert Museum, and a number of his designs were issued in R. Ackermann's Repository of Arts, and reprinted in Ackermann's Architectural Hints, 1813. The coloured lamp design was printed with the entry for a related lamp sold from Clare College, Cambridge, Sotheby's, London, 4 July 1979, lot 11.